Last night, before a packed house in the Fajardo Municipal Equestrian Park in Puerto Rico, Subriel Matías and Alfredo ‘Ojo’ Santiago, both from Fajardo, were victorious against former world title challengers. 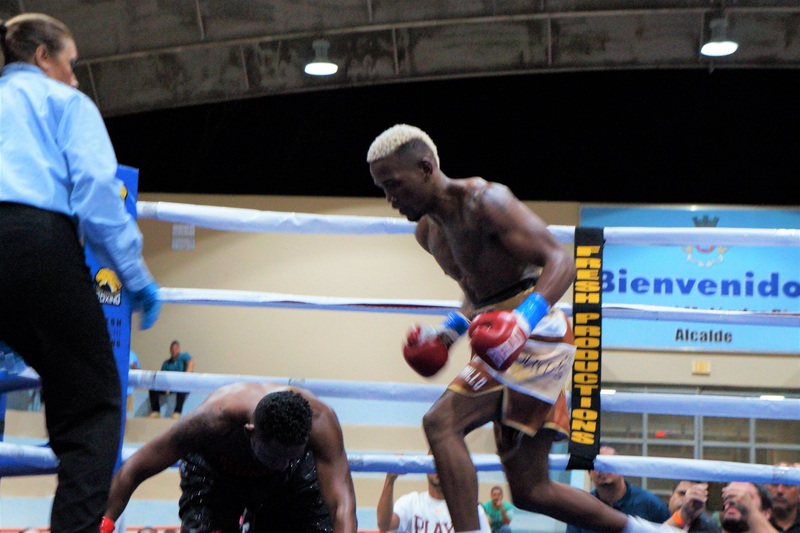 In the main event, Subriel Matías (9-0, 9 KO) defeated by technical knockout at 33 seconds of the third round, Colombian and former world contender, Daulis Prescott (31-7, 23 KO) in a 10-round fight in the 140 pounds. Prescott visited the canvas twice in the second round and once in the third to end the fight. In his resume, Matías has impressive victories by knockout on rising prospect Jeffrey Fontánez, former Venezuelan Olympian Patrick López and Brazilian puncher, Joaquim Carneiro. In the co-main event, Alfredo ‘Ojo’ Santiago (9-0, 2 KO) defeated by unanimous decision the former world contender, Juan Jose Montes (25-7-2, 15 KO) of Mexico, in a 10 round at the maximum weight of 133 pounds. The three judges scored 100-90. In his short career, Santiago has notable victories by decision over: the former Mexican Olympian, Arturo Santos Reyes, the world contender and current FECARBOX CMB champion Jayson ‘La Maravilla’ Vélez and the always seasoned, Andrés ‘Pajita’ Navarro. In the middleweight, José Villarán (3-0, 2 KO) of Loíza won by unanimous decision to José León (0-2) of San Juan. The three judges scored 40-36. In the welterweight division, Patrick Cora (2-0, 2 KO) San Juan defeated by technical knockout at 1:26 of the fourth round to Fernando Semidey (0-3-1) of Trujillo Alto. In the bantamweight, Jonathan ‘Bum Bum’ Lopez (2-0, 2 KO) of Humacao def. Kenny Julián Agosto (0-1) of Vega Alta by technical knockout to a second of the third round. Agosto visited the canvas in the second round. Lightweight division, Darrell Rivera (1-0, 1 KO) of San Juan defeated by technical knockout at 2:56 of the third round to Carlos Diaz (0-1) of Bayamón. In the flyweight, Oscar Marrero (1-1, 1 KO) Luquillo won by technical knockout at 2:20 of the second round over Christian Santos (0-5) of Mayagüez.